Tha Ceàrnag Sheòrais mar chridhe shamhlachail Ghlaschu an latha an-diugh agus do Ghàidheil a’ tighinn dheth trèana aig Stèisean Sràid na Banrighinn, glè thric b’ e a’ chiad sealladh a bh’ aca air a’ bhaile-mhòr. Ged is dòcha nach eil a theisteanasan Gàidhlig faicsinneach, a dh’aindeoin sin tha àireamh de cheanglaichean Gàidhlig an làthair. 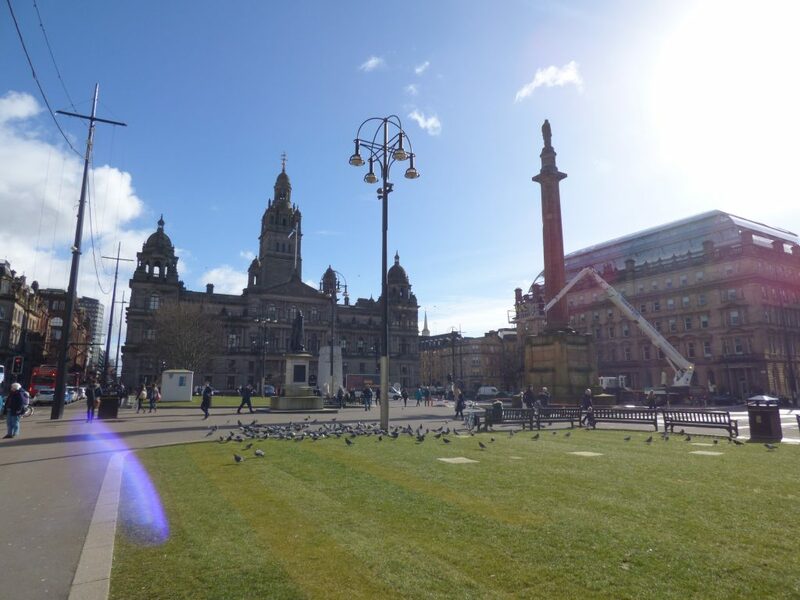 George Square is the symbolic heart of modern Glasgow and for Gaels arriving by train at Queen Street Station, it was often their first sight of the city. Although its Gaelic credentials are perhaps not obvious, there are nonetheless a number of interesting Gaelic connections. Tha Seòmar Malairt Ghlaschu stèidhichte aig àireamh 30, an dèidh a bhith a’ coinneachadh aig toiseach cùis ann an Taigh-seinnse ainmeil Tontine air Sràid Earra-Ghàidheal. Bha Gàidheil leithid Dùghall Bannatyne agus Seumas MacFhionnlaigh nam meadhan air stèidheachadh an t-Seòmair ann an 1783. Chaidh Bannatyne air adhart gu bhith air fhastadh mar mhaighstir-puist Ghlaschu ann an 1809. Bha MacFhionnlaigh aig teis meadhain an togail air rèisimeid de choisridh, na Royal Glasgow Volunteers, airson sabaid ann an Cogadh Neo-eisimeileach Aimeireagaidh. Thug e seachad sùim mhòr airgid agus chluich e a’ phìob airson na caismeachd trusaidh. Tha na h-ìomhaighean snaighte nan cuspair san òran èibhinn le Iain MacPhàidein (1850-1935) ‘The Morning After’. Fo bhuaidh na dibhe, tha e a’ smaoineachadh orra a’ toirt ceum sìos bho an sorchain airson a dhol a dhannsa. Am measg nan ìomhaighean air an ainmeachadh tha aon le Gàidhlig – Sir Cailean – agus dithis gun Ghàidhlig – Raibeart Burns agus Bhaltair Scott – a bha gu mòr an sàs ann an cumadh bheachdan romansach nan Gall mun Ghàidhealtachd. Glasgow’s Chamber of Commerce is situated at No.30, having originally met in the famous Tontine Tavern in Argyle Street. Gaels such as Dugald Bannatyne and James Finlay were instrumental in the founding of the Chamber in 1783. Bannatyne went on to be appointed postmaster of Glasgow in 1809. Finlay had been central to the raising of a regiment of infantry, the Royal Glasgow Volunteers, to fight in the American War of Independence. He gave a substantial sum of money and played the bagpipes for the recruitment parade. The square’s famous statues are the subject of a humorous song by John MacFadyen (1850-1935) ‘The Morning After’. Under the influence of drink, he imagines them stepping down from their pedestals to dance. The statues named include one speaker of Gaelic – Sir Cailean – and two non-speakers – Robert Burns and Walter Scott – who were instrumental in shaping Lowlanders romantic ideas about the Gaelic-speaking Highlands. Chaidh Carragh-cuimhne Ghlaschu a thogail ann an 1922 mar chuimhneachan orrasan a thuit sa Chiad Chogadh Mhòr. Chaidh còrr air 200,000 fear sa bhaile a thogail – aon chòigeamh den àireamh-sluaigh sa bhaile – a’ gabhail a-steach mòran aig an robh Gàidhlig no mic luchd-labhairt na Gàidhlig. Chaill còrr air 8,000 de fhir Ghlaschu am beatha sa Chogadh Mhòr agus chaidh 34,500 eile a leòn. Bha mòran de na mairbh air an tiodhlacadh ann an cladhan cèine air nach b’ urrainn an teaghlaichean tadhal mar gheall air cosgais, agus cha d’ fhuaireadh cuirp mòran dhiubh a-riamh. Bha an Carragh-cuimhne a’ toirt dhaibh àite airson cuimhneachadh pearsanta a thuilleadh air cuimhneachadh cathaireach. 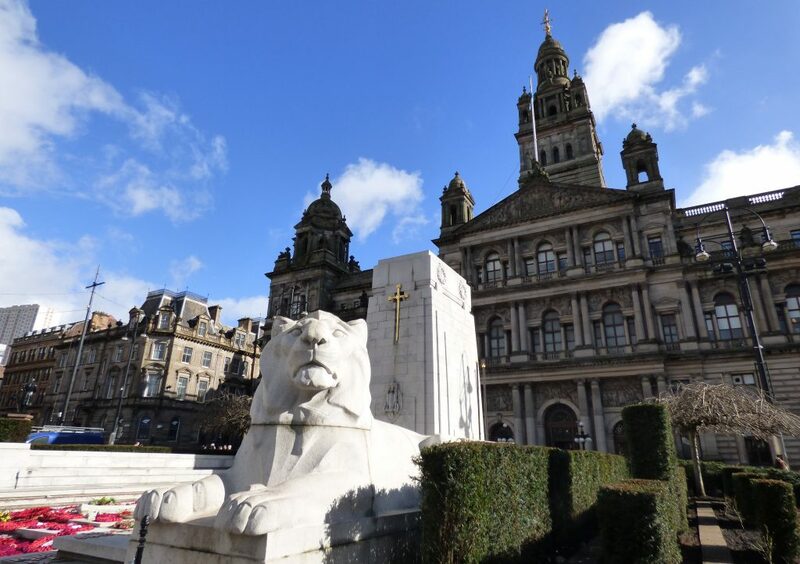 Glasgow’s Cenotaph was built in 1922 to commemorate those who died in the First World War. The city mobilised over 200,000 men – one-fifth of its population – including a great many who were Gaelic-speakers or the sons of Gaelic-speakers. Over 8,000 Glaswegians lost their lives in the Great War and a further 34,500 were injured. Many of the dead were buried in foreign cemeteries which their families could not afford to visit, the bodies of many were never found. The Cenotaph provided a focus for personal as well as civic remembrance. Rugadh e ann an Glaschu ann an 1792 do phàrantan aig an robh Gàidhlig, agus chaidh Cailean Caimbeul air adhart gu bhith mar aon de na saighdearan a b’ ainmeile ann am Breatainn, ag èirigh gu ìre Marasgal Cogaidh, an ìre as àirde san arm Bhreatannach. Aig aois 16 bliadhna, bha e a’ sabaid anns a’ bhlàr ainmeil Napoleonach aig Corunna fo chomannd saighdear eile à Glaschu, Sir Iain Moore (1761-1809) air a bheil cuimhneachan ìomhaigh-snaighte ann an Ceàrnag Sheòrais. Chaith an Caimbeulach fad a bheatha anns an t-seirbheis armailteach agus bha e an sàs ann am mòran de na batail a b’ ainmeile ann an eachdraidh ìmpireil Bhreatainn san 19mh linn. Bha e na chomanndair air a’ Bhragàd Ghàidhealach (an ‘Loidhne Dhearg Chaol’), a’ mhòr-chuid aig an robh Gàidhlig, aig Blàr Balaclava sa Chrimea, agus fhritheil e mar Phrìomh Chomanndair nan Ìnnseachan aig àm Aramach nan Ìnnseachan ann an 1857. Choisinn an cùram a bha e a’ nochdadh dhaibhsan a bha a’ frithealadh fodha, am far-ainm ‘Old Careful’ dha, agus bha spèis fìor mhòr ga thaisbeanadh dha. Fhuair e bàs ann an 1863 agus chaidh a thiodhlacadh ann an Abaid Westminster. Chaidh marbhrann fada Gàidhlig a sgrìobhadh dha le bard Comann Gàidhlig Inbhir Nis agus tha e foillsichte sna Tar-ghnìomhan aca. Bha an ìomhaigh shnaighte den Chaimbeulach a chuireadh suas ann an 1868, dèante leis an t-snaigheadair Èireannach, John Foley. 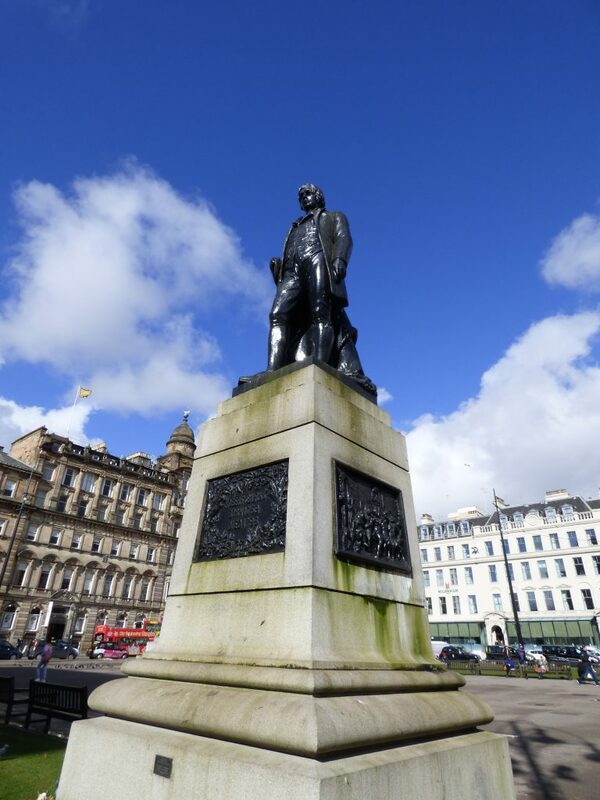 Born in Glasgow in 1792 to Gaelic-speaking parents, Colin Campbell went on to be one of Britain’s most illustrious soldiers, rising to the rank of Field Marshall, the highest rank in the British army. 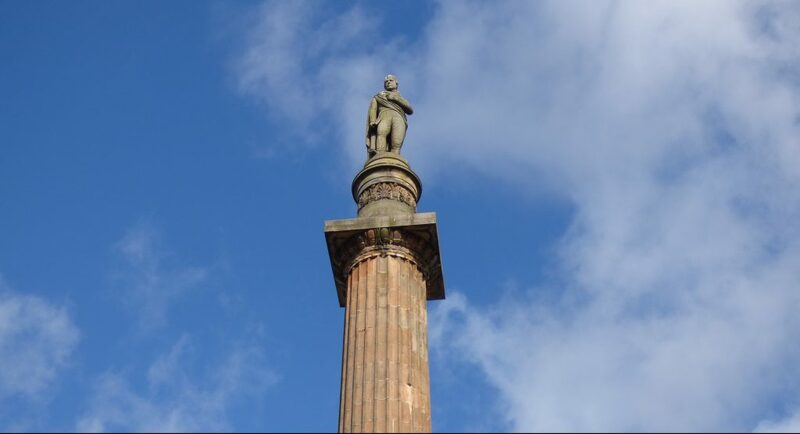 At the age of 16 he fought at the famous Napoleonic battle of Corunna under the command of fellow Glaswegian Sir John Moore (1761-1809) who is also commemorated by a George Square statue. Campbell devoted his entire life to military service and was involved in many of the most famous engagements of 19th century British imperial history. He commanded the predominantly Gaelic-speaking Highland Brigade (the ‘Thin Red Line’) at the Battle of Balaclava, Crimea, and served as Commander-in-Chief of India during the Indian Mutiny of 1857. His concern for the welfare of those who served under him earned him the nickname ‘Old Careful’ and he was held in exceptionally high regard. He died in 1863 and was buried in Westminster Abbey. A long Gaelic elegy was composed for him by the bard of the Gaelic Society of Inverness and published in their Transactions. The statue of Campbell, erected in 1868, is by the famous Irish sculptor John Foley. Scotland’s national bard did not himself speak Gaelic, but he had a number of Gaelic connections, most famously a brief but intense affair with Mairi Caimbeul (Mary Campbell) known as ‘Highland Mary’ (1763-1786). She was a Gaelic-speaker from Dunoon whom he met when she was working as a servant in Tarbolton. The pair planned to emigrate to Jamaica together, but she contracted typhus and died suddenly at the age of 23. Burns composed a number of poems to her during her life and after her death. Burns’ admiration for Gaelic culture is reflected in his naming his favourite sheep dog, Luath (Gaelic for ‘swift’) in honour of the hunting dog which belonged to the great hero Cú Chulainn in James MacPherson’s Ossianic poems. These were a reworking of Gaelic epic traditions published, to international acclaim (and controversy), in 1760. Cha robh Gàidhlig aig bàrd nàiseanta na h-Alba fhèin ach bha mòran cheanglaichean Gàidhlig aige, agus am measg an fheadhainn a b’ ainmeile bha an dlùth-chàirdeas goirid ach dian a bh’ aige le Mairi Chaimbeul, aithnichte mar ‘Highland Mary’ (1763-1786). Bha Gàidhlig aice agus bha i à Dùn Omhain, agus choinnich e rithe nuair a bha i ag obair mar shearbhant ann an Tarbolton. Bha an dithis a’ planadh air às-imrich gu Iameuga còmhla, ach ghlac i am fiabhras-dubh agus bhàsaich i gu h-obann aig aois 23 bliadhna. Sgrìobh Burns àireamh de dhàin dhi fad a beatha agus às dèidh a bàis. Tha an spèis a bh’ aig Burns do chultar na Gàidhlig air fhaicinn anns an ainm a thug e don chù-chaorach a b’ fheàrr leis, Luath, mar urram don chù seilge a bhuineadh don mhòr-ghaisgeach Cú Chulainn ann an dàin Oiseanach Sheumais Mhic a’ Phearsain. Bha iad sin mar ath-obrachadh air na traidiseanan mòra Gàidhlig a chaidh fhoillseachadh le sàr-chliù (agus connspaid) eadar-nàiseanta ann an 1760. Tha Burns ainmeil mar neach-cruinneachaidh fhuinn traidiseanta Albannach ris na chuir e facail ùra. Tha àireamh dhiubh nam fuinn thraidiseanta Gàidhlig. Am measg nan eisimpleirean tha ‘My Heart’s in the Highlands’ ris an fhonn Fáilte na Misg agus ‘Ae Fond Kiss’ ris an fhonn a tha aithnichte ann am Puirt Ruairi Dhall. Bha dà chlàrsair ainmeil den ainm seo ann an Alba: Ruairidh Dall Mac Mhuirich (c.1656 – 1714), à Bràgair ann an Leòdhas a bha na chlàrsair do Chlann ‘Ic Leòid ann an Caisteal Dhùn Bheagain; agus Ruaidhrí Dall Ó Catháin (c. 1580-1653), a rugadh ann an Contae Aontroma ach a chuir seachad mòran de a bheatha ann an Alba a’ cluich do dh’uaislean na h-Alba agus fiù sa chùirt rìoghail. Chaidh am pìos a b’ ainmeile a bh’ aige, Tabhair Domh do Lámh a bha aithnichte cuideachd mar Da Mihi Manum, a sgrìobhadh ann an Caisteal Eglinton ann an Siorrachd Àir. Burns is noted as a collector of traditional Scottish tunes to which he provided new lyrics. A number of these are traditional Gaelic melodies. Examples include ‘My Heart’s in the Highlands’, set to the tune Fáilte na Miosg (‘Salute to Drunkness’), and ‘Ae Fond Kiss’, the tune of which is identified as Puirt Ruairi Dall (‘Blind Rory Port’). There were two famous harpers of this name active in Scotland: Ruairidh Dall Mac Mhuirich, Roderick Morison, (c.1656 – 1714), from Bragar, Lewis, who was harper to the McLeods at Dunvegan Castle; and Ruaidhrí Dall Ó Catháin (c. 1580-1653), who was born in Co. Antrim but spent much of his life in Scotland playing for the nobility of Scotland and even the royal court. His most famous composition, Tabhair Damh do Lámh (‘Give Me Your Hand’, known also as Da Mihi Manum), was composed in Eglinton Castle, Ayrshire. Sir Walter Scott, George Square Glasgow. Tha a’ chiad charragh-cuimhne a-riamh do Sir Bhaltar Scott (1771-1832), ann am meadhan Ceàrnag Sheòrais. B’ e aon de na sgrìobhadairean bu mhotha ann an Alba agus b’ e a’ chiad sgrìobhaiche air an nobhail eachdraidheil. Ged nach robh Gàidhlig aige fhèin, bha Scott a rugadh ann an Dùn Èideann, na mheadhan air seasamhan Gallta atharrachadh a thaobh cànan is cultar na Gàidhlig. Bha e na bhall gnìomhach agus na chathraiche air Comann Gàidhealach Dhùn Èideann a chaidh a stèidheachadh ann an 1784, agus bha e am measg luchd-stèidheachaidh a’ Chomainn Cheiltich Rìoghail (1820), a bha ag amas air ‘ùidh adhartachadh ann an eachdraidh, traidiseanan, cànan na Gàidhlig, ealain is ceòl na h-Alba’. Tharraing Scott air eachdraidh is cultar na Gàidhealtachd ann an àireamh de a phìosan obrach, gu h-àraid an dàn mòr aige ‘The Lady of the Lake’, an nobhail aige mu Aramach nan Seumasach, Waverley, agus gu dearbh an nobhail chliùiteach aige, Rob Roy, stèidhichte air beatha Raibeart Ruadh MacGriogair (1671-1734). Bha an cleachdadh dràmadach a rinn Scott air a’ phìob mhòr agus an t-èideadh Gàidhealach aig àm tadhail an Rìgh Seòras IV gu Dùn Èideann ann an 1822, na phàirt den ath-dhealbhadh aige air cultar Gàidhealach ann an Alba far an robh luchd-còmhnaidh a’ coimhead ris an eadar-dhealachadh aca bho Shasainn a nochdadh ann an dòigh nach robh bagairteach gu poilitigeach. Tha luchd-càinidh air a ràdh gun robh Scott a’ stèidheachadh tionndadh ‘tartan is aran-milis’ de dhearbh-aithne na h-Alba, a tha a’ cur na Gàidhlig agus na Gàidheil dìreach mar phàirt den tionndadh bhrèagha agus romansach den Ghàidhealtachd, ga chumail agus gan cumail a-mach à Alba nuadh-aimsireil agus adhartach. Tha luchd-dìon a’ coimhead ris na buannachdan eaconamach an lùib ùidh eadar-nàiseanta ann an Gàidhealtachd Scott, agus ris an fhìrinn gu bheil e do chuid air a bhith na chachaileith gu conaltradh le traidisean Gàidhlig a tha nas ùghdarrail. At the centre of George Square is the first ever monument to Sir Walter Scott (1771-1832), one of Scotland’s greatest writers, and inventor of the historical novel. Although not himself a Gaelic-speaker, Edinburgh-born Scott was instrumental in changing Lowland attitudes to the Gaelic language and culture. He was an active member and chairman of the Highland Society of Edinburgh (founded 1784) and was among the founders of the Royal Celtic Society (1820) which aimed ‘to promote interest in the history, traditions, Scottish Gaelic language, arts and music of Scotland’. Scott drew on Highland history and culture in a number of his works, most notably his influential epic poem ‘The Lady of the Lake’, his novel of the Jacobite Rising, Waverley, and, of course, his much-loved novel Rob Roy, based on the life of Raibeart Ruadh MacGriogair (‘Red-haired Robert MacGregor’) (1671-1734). 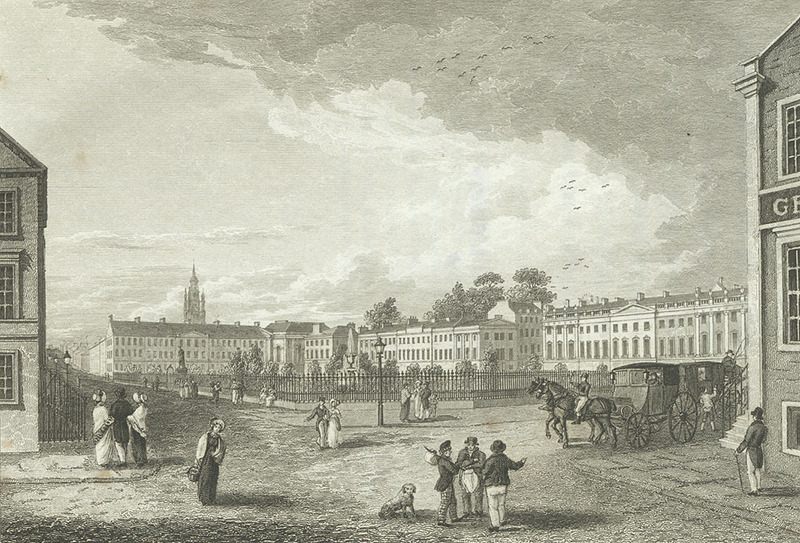 Scott’s theatrical use of bagpipes and highland dress during King George IV’s visit to Edinburgh in 1822 was part of his repackaging of Highland culture for an increasingly urban Scotland whose inhabitants sought to express their difference from England in a way which was politically unthreatening. Critics have accused Scott of establishing the ‘tartan and shortbread’ version of Scottish identity which casts Gaelic and the Gaels only as part of a beautiful and romantic version of the Highlands, excluding it and them from the narrative of a progressive modern Scotland. Defenders point to the economic benefits of international interest in Scott’s Highlands, and to the fact that for some it has been the gateway to engagement with a more authentic Gaelic tradition.